CONNECTING WITH CIRCE If you have any questions about spells or ways of magic don’t hesitate to ask Circe, she is defiantly willing to help out her kindred. Another way of honoring her is by honoring the Goddess within yourself. I’m sure you’ve heard this a thousand times, but really there is one in there! Trust your intuition like Circe always did, and that inner nudging to do certain things. This especially goes towards magical workings as well. If you feel that you need to tweak a ritual or spell in any way because it feels right to you, then by all means go a head, because what makes a spell powerful is your own personal power and touches. Plus one of the ways our guides and deities speak to us is through our feelings. 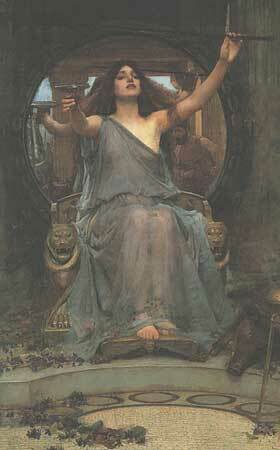 So trust your inner Circe.